Family therapy is necessary to address family pain and heal a family’s wounds. I look at the family as an emotional unit, which holds that one family member is inseparable from the family network of relationships. We all start this life with a family, whether that family is composed of blood relatives, adopted parents, or a foster family. This family that we acquire when we are born influences every aspect of our lives, from our first moments to our last. Our family affects who we are and who we become, both for the better and for worse. We learn our vocabulary, our habits, our customs and rituals, and how to view and observe the world around us from our family of origin. We also learn how to love, and how to interact with others from these first important relationships. Nearly all families I have worked with suffer from some sort of dysfunction at one time or another. My goal in working with your family is to help your family work together to heal any mental, emotional, behavioral or psychological problems tearing your family apart and to help your family to regain and retain a sense of wholeness and happiness. Family therapy offers families a way to do this, by helping your family to develop and maintain a healthy, functional family. In order to help a family work together towards a healthy family life, I aim to help family members in improving their communication by solving family problems, understanding and handling special family situations, and creating a better functioning home environment. More broadly, the goals of family therapy depend on the presenting problems of the family. Families may have different challenges thus requiring different approaches. Based on the following scenarios here are just a few of the challenges and goals families may experience. Problems of one family member seem inextricably tied to problems with other family members. In cases where the problem or problems are deeply rooted in the challenges that one faces with other family members. The goal is to address each of the contributing issues and solve or mitigate the effects of this pattern of problems. A family member is suffering from a mental health issue or substance abuse. The goal is to help other family members understand the disorder and adjust to the psychological changes that the family member may be undergoing. Family members who are experiencing a separation or a divorce. The goal, in this case, is to help family members to understand and navigate the new family dynamic. 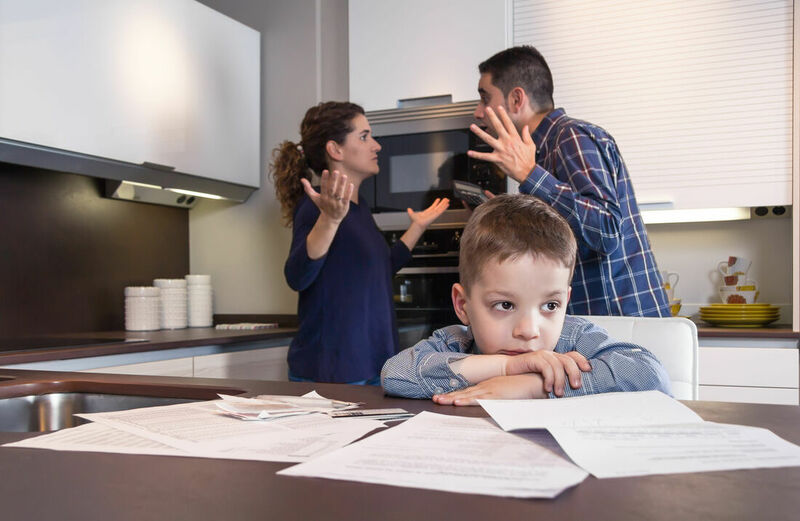 When children are involved in a divorce it is important that they understand they’re not to blame. Helping them to understand the new family structure and developing positive coping mechanisms, allows a healthy relationship with each parent. When one family member is struggling with feeling like the outcast or receives limited support from other family members, the goal is to facilitate increased empathy and understanding for the individual within their family and provide support for them. Families deviating from social norms (unmarried parents, gay couples raising children, etc.) The goals here are not always to address any specific internal problems, but the family members may need help coping with external factors like societal attitudes. Problems arising from poor or rigid boundaries or a lack of boundaries. In this case, the goal is to improve communication and help the family members set healthy, flexible boundaries. What are the benefits of family therapy? Benefits include. Reduced conflict and better anger management skill. More specifically, family therapy can improve the family relationships through. Conflict resolution for family member. In addition, family therapy can enhance skills required for healthy family functioning, including communication, conflict resolution, and problem-solving. Improving these skills for each member of the family increases the potential for success in overcoming or addressing family problems. In family therapy, the focus is on providing all family members with the tools they need to facilitate healing. If you feel your family could benefit by working with me, please give me a call for a free consultation.